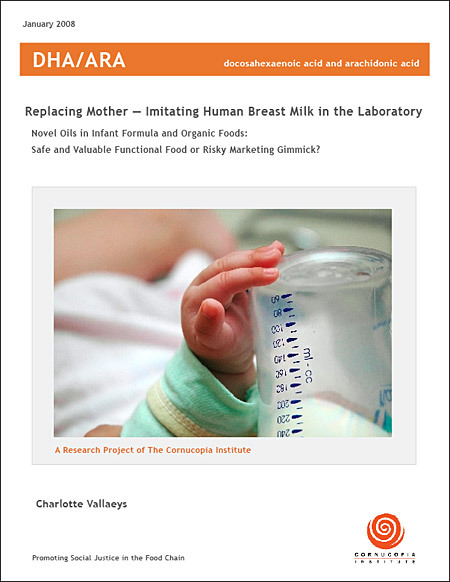 Replacing Mother – Imitating Human Breast Milk in the Laboratory, details research questioning the alleged benefits of adding “novel” omega-3 and omega-6 fatty acids, produced in laboratories and extracted from algae and fungus, into infant formulas. The report presents disturbing research indicating that the new additives placed in infant formula are seriously endangering the health of some formula-fed newborns and toddlers. Aggressive marketing campaigns by some infant formula manufacturers appear to have encouraged new mothers to give up nursing and switch to use of the questionable infant formula products. Take Action Now! Tell the National Organic Standards Board to remove DHA/ARA from organic infant formula and foods. NEW – Watch our 4-minute video on Martek Biosciences Corporation’s DHA and ARA in infant formula. NEW – Avoid organic foods containing Martek’s DHA and ARA. Click here to see a list of products with these unapproved additives. Important Information for Parents: DHA and ARA in infant formula have been linked to severe diarrhea, vomiting, dehydration, and gastrointestinal pain in some infants. Since these additives are relatively new in infant formula, not all pediatricians are aware of their possible side effects. If your baby experienced side effects from DHA and ARA in infant formula, please send an adverse reaction report to the FDA and to Cornucopia. For instructions, read rest of update. Read a sampling of “Adverse Reaction reports” obtained by The Cornucopia Institute’s Freedom of Information Act request to the FDA. The reports detail infant health problems related to DHA/ARA formula. Take Action and help end the suffering! Contact the FDA in support of a warning label on DHA/ARA infant formula products. Click here to listen to a podcast about the report. If you suspect that your infant has suffered an adverse reaction from DHA/ARA infant formula, report this to the FDA.